The Javan rhinoceros is the name of a herbivorous creature that belongs to the order of Perissodactyla and is said to be one of the three species of rhinos that are native to the Asian continent. This lesser one-horned rhino is perhaps the rarest of the large mammal species in the world. What we mean by ‘rare’ here is that it is almost on the brink of extinction. Lesser than 60 of these mammals are said to survive in the wild today; and none of these are in captivity. The Javan rhino is said to exist in two protected areas – Ujung Kulon National Park (Indonesia) and Cat Tien National Park (Vietnam). However, owing to the pressures of human population and the ever-increasing threat of poaching, things do not look too bright. The WWF is active in both areas of Cat Tien and Ujung Kolon; but there is a long way to go before this battle for the survival of the Javan rhino is won. 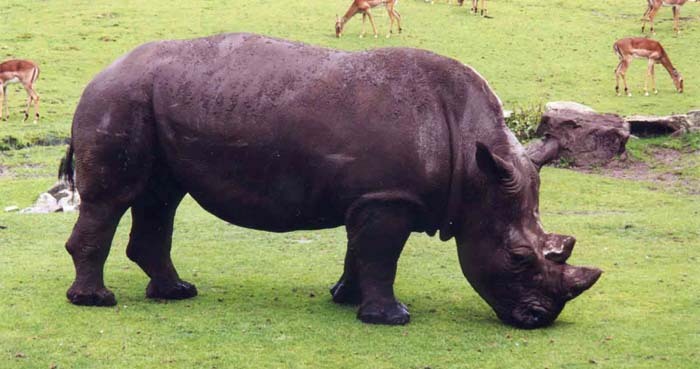 The Javan rhino is dusky-grey in color and has a single horn. The skin is said to have a number of loose folds which give the rhino an appearance of having donned armor plating. 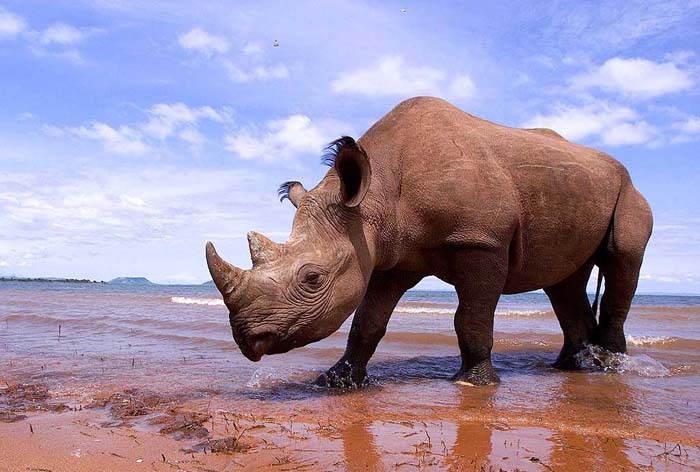 This species of the rhino is extremely similar to the Indian rhino; but it is slightly smaller in size. The head is definitely smaller and the folds of the skin are less apparent than they would be in the Indian rhino. As per recent evidence, the horn might be completely absent or negligibly small in the case of the females. The upper lip is slightly pointed; and this is used to pull the food towards the mouth. The Javan rhino needs water, mud wallows and fruits to survive. They are known to commonly inhabit rainforests that have a good supply of mud wallows and water. They prefer low-lying areas; although, in some cases, these animals have been seen at heights over 1,000 meters in Java, Indonesia. This animal is said to be solitary in habit. The only times they will be seen with other rhinos only when they form pairs during mating season, or when the mothers are nursing their young ones. There isn’t too much information available about the breeding patterns of this species because they have hardly ever been bred in captivity. It is believed that the female rhino will mature at about the age of 5 to 6 years, while the male will take 10 years to get there. The gestation period is said to be around 16 months, which is similar to that of the Indian rhino. The common mating season should last between July to November each year. What Are The Plausible Threats To This Species? It is a known fact that only two very small populations of this rhino remain today. This would mean that this species is very vulnerable to extinction owing to natural catastrophes, poaching, political disturbances and genetic drift. The rhino population that survives in Cat Tien National Park today is said to comprise only 8 rhinos. This in itself is proof to the lowered genetic diversity that remains here. This would mean that they are less capable of surviving any natural disasters or the outbreak of a disease. 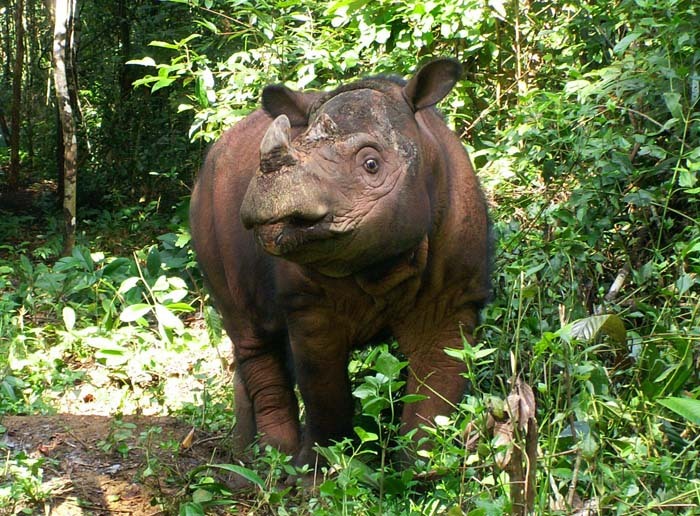 The increasing amount of human population is causing for a strain on the land that used to be the natural habitat for animals such as the Javan rhinoceros. The forests are being cleared to make way for land for agricultural and commercial logging.